The palace was once a small and suburban villa, known as Nottingham House. New monarchs William III and Mary II chose this modest mansion in 1689 to be their country retreat. Over the years, Stuart and Georgian monarchs transformed the palace into a fashionable home for Britains young royal families. 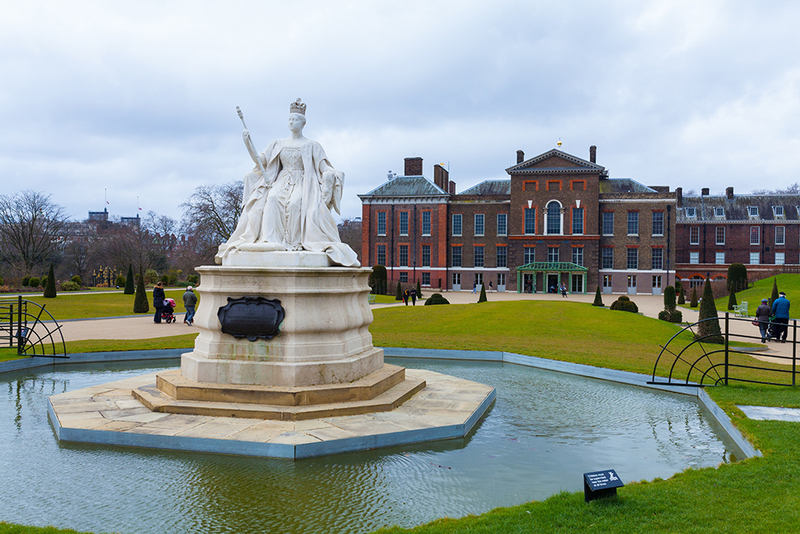 Queen Caroline shaped the palace and gardens, and Queen Victoria spent her childhood here. She left to live in Buckingham Palace in 1837. Kensington later became home for minor royals, including her daughter, the talented sculptor Princess Louise. More recent inhabitants include Diana, Princess of Wales, Princess Margaret, and currently, the HRH The Duke and Duchess of Cambridge and their children, along with HRH Prince Harry and Ms Meghan Markle. When visiting the Kings State Apartments, one thing you will noticed is that they are surprisingly sparse. This is because unlike domestic rooms, the State Apartments were used for audinces and meetings, however these rooms contain many sculptures and works of art, such as the terractta busts of George II and his wife Queen Caroline, made by Michael Rysbrack in 1738 and 1739. Kensington Palace is currenly exhibiting Diana: Her Fashion Story, is the sell-out exhibition featuring some of Diana, Princess of Wales' most famous outfits. Wander up the King's Staircase - the opulent entrance to the King's State Apartments, lavishly decoraed by William Kent. In Georgian times, visitors to court could only enter if their clothes and jewels passed muster with the guards. Some of the guards in the red uniforms stand among the figures of the arcade painted on the walls, many of hem identifiable as members of the royal court. You can also go on an interactive adventure at the Palace. Meet a character from history, explore all around you. visit to the palace is complete without a visit to the Palace Gardens. The beautiful Sunken Garden was planted in 1908, transforming part of the gardens previously occupied by potting sheds into a tranguil ornamental garden of classical proportions. It was modelled on a similar garden at Hampton Court Palace and celebrated a style of gardening seen inthe 18th century. Kensington Gardens began life as a King's playground; for over 100 yeards, the gardens were part of Hyde Park and hosted Henry VIII's hugh deer chase. There are a number of stations close to Kensington Palace - High Street Kensington (on the Circle and District line) is approximately a 10- 15 minute walk. Queensway station (on the Central line) is approximately a 10-15 minute walk. Notting Hill Gate station (on the Central, Circle and District lines) is about a 20-25 minute walk.